Lakeville, CT - May 24, 2008 - All three APR Motorsport VW GTI's finished the KONI Challenge ST race during the Lime Rock Park GT Classic today, a strong showing for cars in only their second race of their short lives. With two cars in the top twenty, APR Motorsport was in a heavy push to the front when the checkered flag flew after two and a half hours of extremely competitive racing. The #171 car, driven by Ian Baas and Dion von Moltke, finished in 14th place, racing in the thick of the pack for the entire race. von Moltke, who drove first, made over ten passes in the first 45 minutes of the race, placing the car as high as 10th, which is where the car stood when he handed the wheel over the Baas. Baas immediately tore towards the front, picking up three spots in the first 20 minutes and catching the lead pack. Baas ran consistent lap times in the mid 1:01's, putting him with the top five finishing cars in terms of speed, but yellow flags and lapped cars made the chase to the front quite tough. Baas said "I cannot tell you how great the APR GTI was today. These cars has come so far since Daytona. Today's race was really competitive and fun, and we are pretty close to the pace of the front runners. If the race had been three hours, instead of the allotted 2.5, we'd likely have had a top ten finish." von Moltke added " I cannot thank the team enough for such a great car. I did my best to push to the front and experienced a lot of great racing with some very fast and competitive drivers. I kept my, and thankfully my cars, noses clean. When I handed the car off to Ian, who proved to be incredibly fast. I really felt we could have had a top ten finish. Sadly, with all the yellows and lapped traffic, the race ended a bit to quickly for us." Car #191, driven by TV personality and racing star James Hunt, along with sprint car specialist Mike Sweeney, experienced a top twenty finish in only their first race of the season with APR Motorsport. Hunt drove first, and gained six positions in the first hour, pushing his way towards the front with solid, clean driving before handing the car over to Mike Sweeney at the half race point. Sweeney, who was in his first ever pro race, gained a handful of positions and drove a very competitive stint, posting times in the mid 1:02's, the same as Hunt. Hunt said "Wow, what great cars! APR has these cars so developed for first year cars. It's actually hard to believe these cars are only in their second race! The car handled well and was as fast as all but the fastest cars in a straight line. 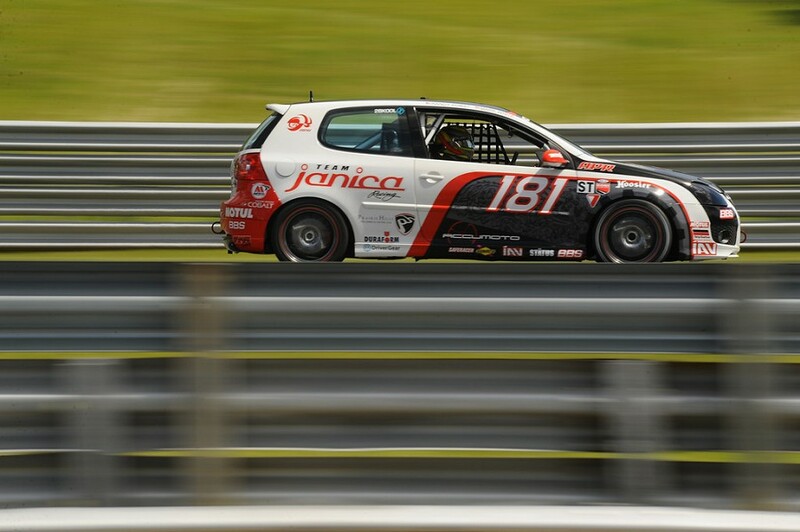 The racing was tough and we experienced a little bit of rubbing, but I really enjoyed this utlra-competitive racing the series and Lime Rock offered." Mike Sweeney went on to add "I am a rear wheel drive specialist, normally racing sprint cars, but I was so impressed with these front drive GTi's. I cannot tell you how balanced and quick these cars are. As for the racing, I did my best to race as fast and be as respectful of the other cars out there. The racing was so aggressive and competitive, and the speed differential within the pack was astounding. Every lap was like a qualifier. It's was just push, push, push! "